Knowledgeable facts - 90% height growth depends upon your genetics, yes it is right that most of the height growth is depends on the genetics. This blog is not for those people who are above the age of 22 because after the age of 22 many peoples don't grow, but its hard to grow for them but not impossible. in our human body, there is a hormone called human height hormone which is responsible for the increase in height growth in the human body. if your age is 12-19, then give it a try. Diet - adding good green leafy vegetables in your daily diet is very helpful to increase height hormone. you have to add some macronutrients like protein. which is very good for your height growth. protein is an essential way to increase height growth. there are some foods which contain a good amount of protein in it, like chickens, eggs, milk, yogurt, and fish. you can add nuts in your diet too because they help to build new tissues in your body which promotes height growth. you have to add ashwagandha in your diet because it promotes height growth, it contains many essential nutrients in it which responsible for increasing the bone density. Vitamins and minerals - if you are talking about to increase height growth then there is major role of joints and bones of your body, vitamin d is essential vitamin for your height growth, and for the abortion of the vitamin d you have to take some amount of calcium, and calcium is a powerful mineral which is responsible for making your bones strong. you have to take vitamin b because it helps to promote the growth of the body. you have to take vitamin c because it promotes the growth of bones and teeth. you have to take vitamin b12 because it promotes the growth of nails and hairs in the body. you have to take phosphorus rich foods in your daily diet because it makes your bones strong, 79% phosphorus is present in the bones. you have to add zinc-rich foods in your diet because zinc is very powerful mineral which promotes the height growth in the human body. Workout - You have to do pull ups or chin ups every day as a warm-up, you can do it in your gym or outside your gym. you have to do rope skipping at least for 15 minutes a day. You have to stretch your body and stretch your lats. in stretching, there are two exercises which is cobra stretch and super cobra stretch they both exercises are wonderful for height growth. swimming at least for 4 days a week could be very beneficial for increasing your height. basketball is a sport, which helps in muscle growth by increasing tension in the muscle. volleyball is a sport which also promotes height growth. cycling is something that everyone can do, it increases your stamina as well as helps to promote your height growth. sprinting is the most powerful way to increase height growth, running for long miles helps to increase your height growth, you can run for 3-4km a day for better results, so don't miss it. Proper sleep - when you sleep your body release height growth hormone, because that is the time when your body grows, if your age is between 12-22 then you have to sleep for at least for 7-8 hours a day. 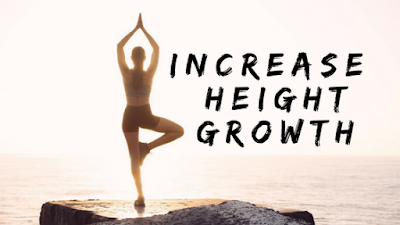 this is the best method to grow your height faster than ever. If you follow these tips and add in your daily life you will definitely see the better results.